A Columbus Ohio Visitation Attorney article about Domestic Violence, Visitation, and Child Custody. 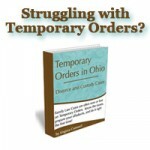 In Ohio, domestic violence is legally relevant, and something the court must take into account when making orders regarding children. It is important to note that the law does not require a court to consider allegations of domestic violence; it requires the court to consider convictions of domestic violence. There is a reason for this. False reports of domestic violence are fairly common when parties are fighting over custody. Sometimes, one parent will attempt to create the illusion of domestic violence in order to gain the advantage in a custody battle. Unfortunately, domestic violence is everywhere, in every income level, and in every culture, and often claims of domestic violence are very real. If you have a court order for visitation between a parent and a child, NOTHING but another court order will relieve you from your obligation to provide the child for visitation. ALLEGATIONS of domestic violence do not change your court orders. The advice of a police officer does not change your court orders. Filing a police report and/or pressing charges does not change your court orders. Only another court order will change your obligation to provide the child for visitation. In addition, domestic violence perpetrated against you, even if it results in a conviction, will not necessarily stop visitation. In the eyes of the court, sometimes parents who cannot get along with each other, and who have anger management problems can still parent their child without violence. However, the more incidents of domestic violence that have occurred between parents, the more concerned the court becomes that it is likely to occur between the abusive parent and the child. For the victim of domestic violence, it is a frightening but all too common nightmare to have to let their child visit with their abuser. Unfortunately, due to the many, many false reports of domestic violence that a court making a custody decision receives every year, they are skeptical, and sometimes jaded, regarding the reality of domestic violence. If you are the victim of domestic violence, and you are withholding your child from visitation without a court order which allows you to do this, you are putting yourself at risk of contempt of court, and possibly a jail sentence. You do not need the cooperation of the police to get a Domestic Violence Protection Order, but you do need be able to convince a court, by a preponderance of the evidence, that YOU were afraid of imminent physical harm, or that your child is in danger of imminent physical harm. You can also file a police report and request to press criminal charges against the person who committed the domestic violence. Criminal prosecutors may be more likely to believe you because they may not experience as many false reports as a domestic relations court, and for good reason. If someone makes a false report to the police or a prosecutor they can, and sometimes are, charged with the crime. Making a false statement to a court, under oath, is an act of perjury in Ohio.